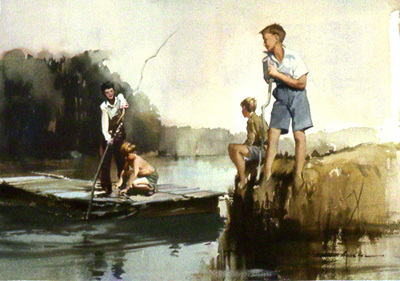 A water colour by Claude Buckle showing a group of boys playing at rafting in a river. A typical river bank scene with the main characters acting out different roles. The characters are placed in the picture to form a group. The activities include fishing and rafting with the two foreground characters in a still like pose which balances the picture. Created in 1969.